San Diego, CA (April 2, 2012) -- Sapphire Energy, Inc., one of the world leaders in algae-based green crude oil production, today announced it has secured the final tranche of a $144 million Series C investment funding. The Series C backers include Arrowpoint Partners, Monsanto, and other undisclosed investors. All major Series B investors have participated. With this investment round, Sapphire Energy�s total funding from private and public sources substantially exceeds $300 million. This round of funding is being used to directly support Sapphire Energy�s active and on-schedule commercial demonstration in Luna County, New Mexico. The Green Crude Farm, also known as the Integrated Algal BioRefinery (IABR), is the world's first commercial demonstration scale algae-to-energy facility, integrating the entire value chain of algae-based fuel, from cultivation to production to extraction of ready-to-refine Green Crude. Some proceeds from previous closes of the Series C financing already have been invested in Sapphire Energy�s continuing operations. This announcement follows several recent partnerships and deals supporting Sapphire Energy�s continued expansion in Green Crude production. Last month, Sapphire announced it will integrate Earthrise Nutritionals� spirulina strain into its growing inventory of cyanobacteria and algae strains to expand resources for algae-to-energy production. 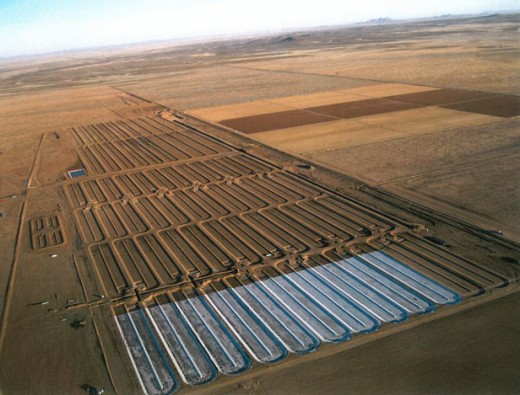 In May 2011, Sapphire announced a multi-year agreement with The Linde Group to co-develop a low-cost system to deliver CO2 to commercial-scale, open-pond, algae-to-fuel cultivation systems, now underway at the Green Crude Farm. In March 2011, Sapphire and Monsanto entered into a multi-year collaboration on algae-based research projects. Sapphire also was awarded a $50 million grant from the Department of Energy and a $54.4 million dollar loan guarantee from the Department of Agriculture, providing security for a privately funded loan.